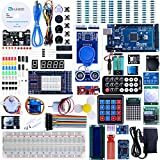 Apr 18, 2017: Which one of these kits would you recommend for an intermediate programmer, who did some beginner/intermediate Arduino stuff a few years back, now wants to get back into it, with an intermediate/advanced kit. The kicker is, it has to be all-in-one, I don't have access to extra parts where I live. Jun 17, 2017: New here: What are some decent starter kits? Jul 14, 2017: Be careful if you have an Elegoo arduino mega! Oct 15, 2017: Is the official Arduino starter kit a good place to start for someone who knows absolutely nothing about electronics? Nov 18, 2017: If every digital thing is a bunch of 1s and 0s, approximately how many 1's or 0's are there for storing a text file of 100 words? Dec 02, 2018: Need help trying to understanding hex numbers please. Feb 05, 2019: Best Arduino Mega/Clone? Feb 21, 2019: In over my head on a project. Need help on an Arduino based Catapult release.